Reading Richard Feynman's autobiographical "Surely you're joking Mr Feynman", I came across a story of an engineer who had designed a complex train of gears for a 'mechanical computer', and in drawing it he had accidentally arranged for one shaft to pass between the spokes of another wheel. Obviously this would prevent the wheel from turning. The foreman shared his old-fashioned engineering 'wisdom' by telling the designer that he needed to specify 'shaft passers' on the spokes. This is all very well on paper, and suprisingly enough conceptual designs do exist, but such a machine would be far from reliable. However, Feynman goes on to describe a similar device that was used on German sea mines in both world wars (apparently). These mines would float to close to the water surface, and they would be tethered to the sea bed. 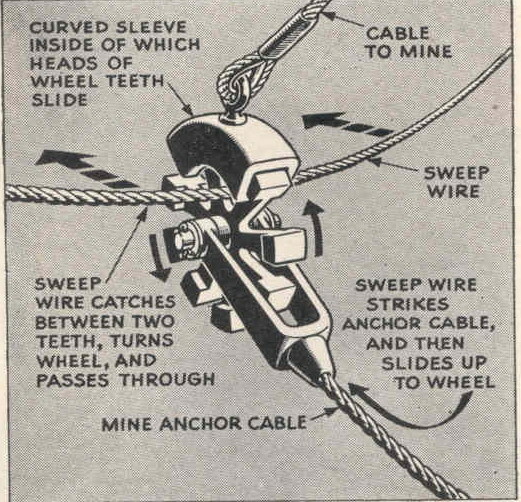 Mine sweepers would try to detect the mines by dragging a cable along the sea bed, presumably between two boats. 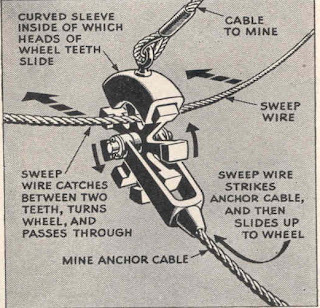 If the cable met the anchor cable of the mine it would pull the mine sideways and tend to stop the mine sweepers or cut the mine's anchor cable so that it floated to the the surface. Either way, they could detect and destroy the mine. However, you have to admire the cunning German engineers who invented this device. It allow the minesweeper's cable to pass safely through the anchor cable un-noticed. Clever eh? I wonder how many minesweeper skippers got into terrible trouble for failing to find mines which destroyed ships passing through the cleared area before the reason was discovered. The "shaft passer" looks like a neat mechanical device. However, does it really work - in a practical sense - in the real world? What is the likelihood of binding in a corrosive environment like salt water? Thank you for this post! I was really curious how it works! Free and open internet indeed! Textual criticism of DNA - proof of evolution! 'Mind' is not a noun! Browser wars - and Microsoft is losing! 2000 years is not long enough . . .
Fun with a piano . . . and 12 pianists! Was Christianity invented by Constantine? The entropy of the soul? By far most scholars . . .
How to beat William Lane Craig! On mobile communications . . .